Delays and flight cancellations look set to continue in France’s airports after security personnel voted to continue their strike, which started on Friday. Unions called for the strike to continue into Monday after a first, abortive meeting with representatives of Sesa, the body representing airport security employers. The bosses made no concrete proposals on the strikers’ demand for wage rises, just promising to negotiate if the strike ended, union negotiators said, adding that they walked out after only 30 minutes. The strike has had most effect at Lyon, Paris’s Charles de Gaulle and Toulouse. 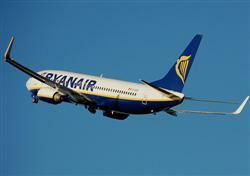 Ryanair has celebrated yesterday its 50 millionth passenger in France. The lucky winner, Mrs Peyric, from Languedoc-Roussillon Region, was travelling on the flight FR-8023 from Brussels-Charleroi to Carcassonne. Mrs Peyric won a holiday package to Porto. The low-cost airline started to operate in the French market in 1997 with its first route from Paris Beauvais to Dublin. Thanks to this route Ryanair carried 128.000 passengers the same year. 14 years later, Ryanair operates from/to 27 French airports, carrying over 7 million passengers a year, with an activity which generates over 7000 jobs in France. Ryanair today (9th Dec) announced that it will continue to encourage passengers to travel lighter, particularly during peak travel periods (June, July, Aug, Sept and Christmas 2012), by increasing its peak period checked-in baggage fees by €5/£5 (from €20 to €25) per bag for all online bookings made from 15th Dec next. To encourage online payment of baggage fees, Ryanair will also increase its checked in bag fees paid at call centres and airports by at least €25/£25 (from €35 to €60) per bag. Low season (Oct – May) online checked-in bag fees will remain unchanged at €15/£15 per bag. Ryanair will continue to encourage all passengers to avoid its baggage fees by not checking in any bags and instead travelling with Ryanair’s free of charge 10kg carry-on bag allowance. Ryanair will also increase its ‘boarding card reissue penalty’ from €40/£40 to €60/£60, from 15th Jan 2012, to try to persuade the less than 10 passengers per day who refuse/fail to bring their boarding card (despite email reminders) to their departure airport as 99.9% of Ryanair passengers already do. “Ryanair continues to incentivise passengers to travel light especially during peak periods by raising our online checked-in baggage fees. As always, baggage fees are avoidable, but for those who chose to check-in a bag during peak travel periods the new fees will apply for bookings made after 15th December next for travel in June, July, August and September 2012. Over 70% of Ryanair passengers will be unaffected by these changes as they already travel with no checked-in bags and instead use Ryanair’s free of charge 10kg carry on allowance. Thanks to Robin at WoW for this. This very exciting video from google shows how they have started to advance their well known and widely used mapping software to feature indoor maps. That is to say maps showing the layout of shopping malls and airports so that via your android powered mobile phone you can orintate yourself to see where you are in an airport (for example) and how to get to your gate or even see what restaurants and shops are there and how you can get to them. For now this service is only available in certain US airports and shopping malls but I'd say it's a pretty safe bet that this will find it's way to mapping French airports in due course. It's also only currently available on Android powered smartphones but I would be surprised if this didn't make it onto the iPhone eventually. flyBe had a good first year of operations between Béziers Cap d'Agde and Southampton. Launched in May this year until the end of September - two flights per week with an Embraer 195 (turbo engine) with 118 seats, the link carried around 6,000 passengers with a load factor of more of 70%. The new 3 flight a week pattern will start from 25 May until 28 September on Mondays, Fridays and Sundays. Thanks to Robin at WoW for this update.